Nothing lasts forever, and certainly my one and only pair of roller-blades was no exception. I felt I had a slight bit of a bond with these things, I remember the day my dad came home with them. I was about, or close to, the same age as my boy. My sister and I were oh so happy to have gotten our very first pair of roller-blades! They were the latest and the greatest at the time, and little did I know then, that they would find a place with me into my adult life (little did I know that my youth sized foot would also stay with me into my adult life). Truth is, the only reason they have stuck around so long is because I was never really a roller-blader, they hardly got used. I was the very occasional, once around the block type when I got them, and somehow they have just managed to hitch a ride in that old storage tote that never quite made it to the donation pile. I used them last about 12 years ago. Probably not the best time in my life to have been rollerblading, but I thought rolling would be better than running considering I was expecting, exercise was important! Anyway, last week we had a party. We had enough friends willing and able to rent a local skating rink for two whole hours. Two hours of only the people we knew, the music we liked, and so it was time to brush up on those long, dormant skating skills. 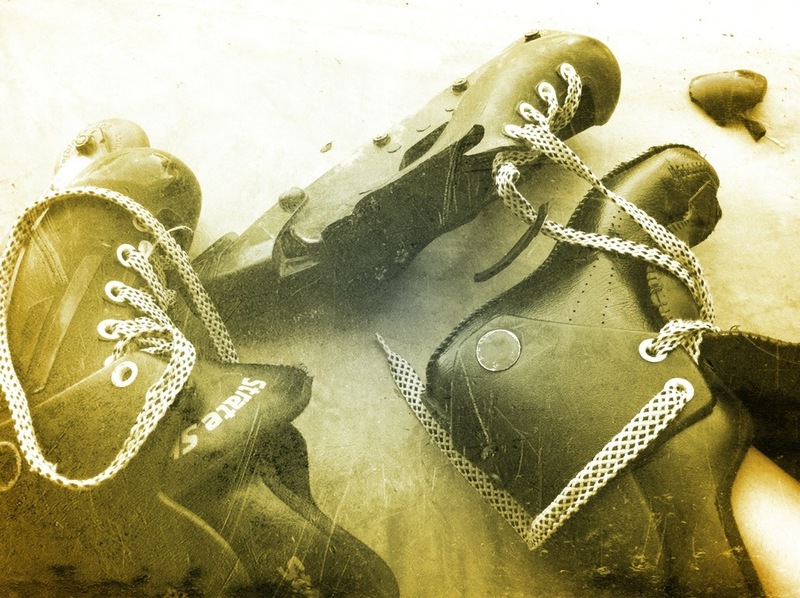 I was prepared, I had my own roller-blades, you might have even been able to call them vintage – they are about twenty years old, that qualifies right? Well now, they are nothing more than trash. So there you have it, the story of my rollerblades and how they ended. Not your everyday shoe story, but it has been a while since I have written about anything that goes on my feet. Despite the tragedy, the night was a great one! I really hope we have the opportunity to rent a skating rink out again in the not too distant future. The Most Fun All Week!